On June 20th, SMR was paged out to respond to a fallen climber in the area of the Tooth. 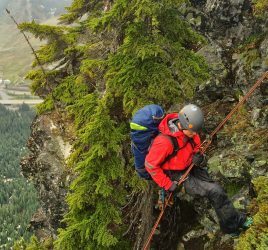 The subject had fallen off a short cliff on the climber’s trail above Source Lake (and below Great Scott Basin), rolled approximately 100 feet down a rocky slope, and then slid another 50 – 100 feet down a narrow snow finger before hitting a small tree. The reporting party indicated that the subject had taken a substantial fall and may be badly injured. Upon arriving to base at Alpental, Team 1 headed up the Snow Lake trail as a single hasty responder to perform an initial medical assessment. Team 2 followed behind with a full-body splint and climbing rope. 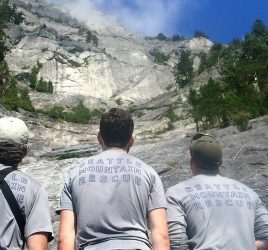 A King County Explorer Search and Rescue Team, plus two additional SMR members, carried the litter, wheel, two 300’ rescue ropes, and a rigging kit. Soon after the page out, the King County Sheriff’s Office Air Support Unit was also requested, given the nature of the subject’s injuries. Once on scene, Teams 1 and 2 worked to stabilize the subject and prepare the scene for the incoming medic and Rescue Specialist from the Sheriff’s Office by chopping out a large platform on the snow slope. At approximately 1930, Guardian 2 from the Sheriff’s Office arrived and dropped the medic, Rescue Specialist, and a Bauman Bag. After carefully backboarding the subject and moving him to the makeshift platform, the medic was hoisted out, followed by the Rescue Specialist and subject. Team 1 and 2 escorted the reporting party back to the Snow Lake trail and out to the trailhead. All teams were out of the field by 2140.